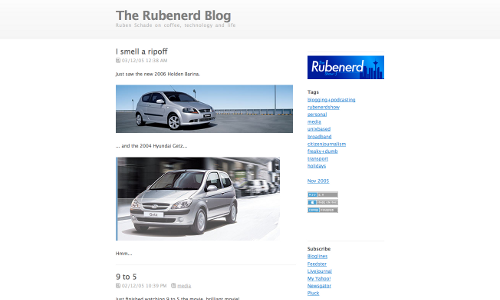 Rubenerd: Rubenerd site history for the 4000th post! 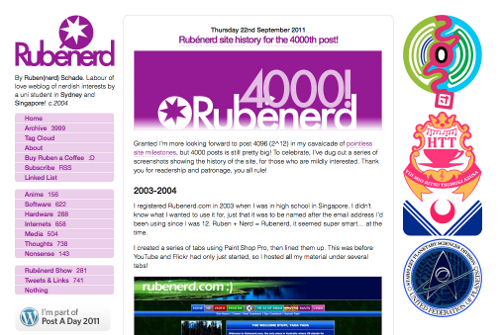 Rubenerd site history for the 4000th post! 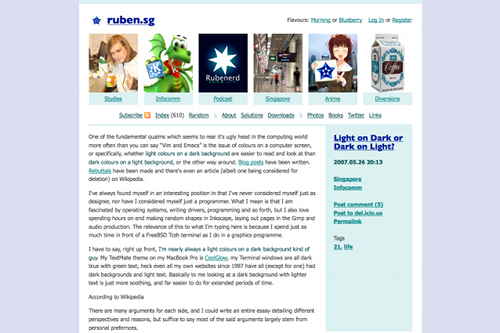 I registered Rubenerd.com in 2003 when I was in high school in Singapore. I didn't know what I wanted to use it for, just that it was to be named after the email address I'd been using since I was 12. Ruben + Nerd = Rubenerd, it seemed super smart… at the time. I created a series of tabs using Paint Shop Pro, then lined them up. This was before YouTube and Flickr had only just started, so I hosted all my material under several tabs! 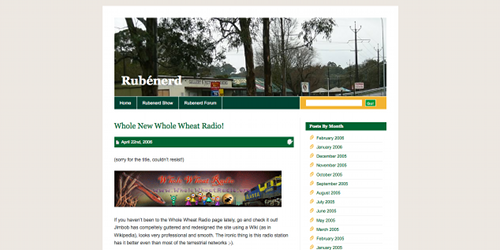 After realising a site with heaps of sections was simply too much work to maintain, I completely ditched the old site and rebooted Rubenerd.com as a blog. I had just started learning Perl so I created a simple CGI script to generate the pages. 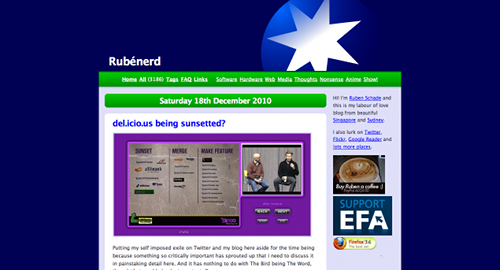 Ironically, I think this earliest version of Rubenerd.com was the best looking, go figure! After a few months I moved to RapidWeaver, a Mac OS X client-side blogging platform. I still think it had by far the best user interface for writing posts I've ever used, though their themes at the time left a little to be desired! When I started studying in Adelaide, I moved from RapidWeaver to WordPress. While RapidWeaver worked great on my PowerMac G5, I couldn't exactly take it back with me when I went back to Singapore during the holiday breaks! I liked the Blix theme, but made the colours bolder and far less attractive. Someone should really have stopped me. Up to this point my blog had been a sporadically-updated sideshow to my podcast, but in 2006 I started blogging on a more regular basis, as can be seen in my site archive. With this in mind, I decided to take the vanilla Sandbox theme and create new themes for my podcast site, and one for the blog to match. I was generally in a pretty dark mood (though not emo!) given family troubles and my mum's rapidly deteriorating health, and I suppose this was reflected somewhat here. I also resurrected the logo I'd designed for my "business" in primary school helping expats fix their printers to tap some of that youthful optimism. This logo has been on all my stuff again ever since :). Having been tired with a dark background for a while, I decided to start from scratch with a new lighter theme I coded myself, and on a new domain. The new site and the htaccess redirects from Rubenerd.com were live for less than 24 hours before I ditched it and went back to the previous one! Changed themes again, also created entirely from scratch. 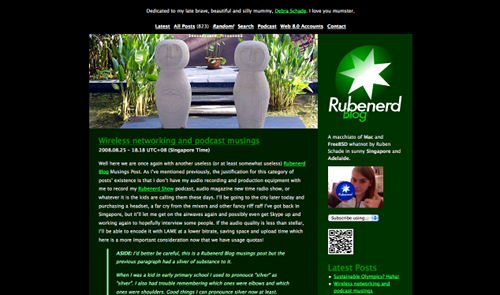 I saw my original Rubenerd.com site design and felt a tingle of nostalgia, so I tried to recreate parts of it and match the colours of the original tabs, with mixed results! Obviously not a lot of progress ;).